Today I want you to take a moment out of your day to think about your child. Think about how he is unique and how special he is. Then, after you have taken some time to think about that, I want you to go to him and tell your boy how unique he is and how much he is valued. 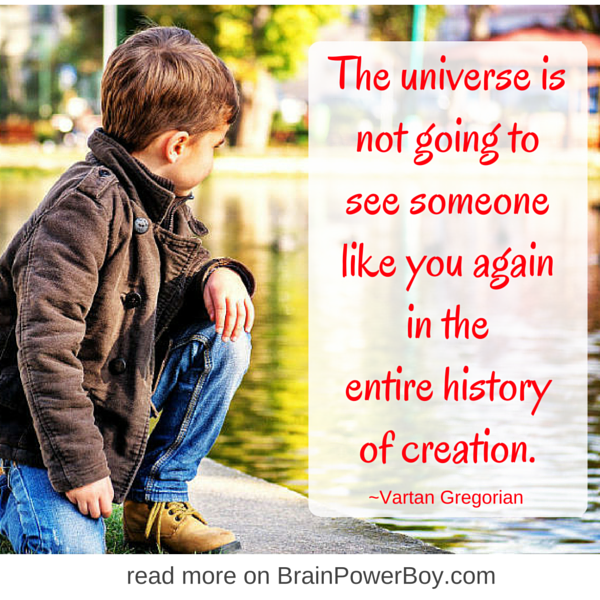 The quote “The universe is not going to see someone like you again in the entire history of creation.” inspired this article. I have had this quote up in our house. I hope you will take the opportunity to share it with your kids. It only takes a moment to tell your boy how unique he is and to share this quote with him. Tell him that you value his uniqueness. It is simply mind boggling to think about, isn’t it? We know that but I don’t think we remember or think deeply about it as we go through life. Letting your children get to really know this while they are young will serve them well as they go out into the world. I had the quote on our chalkboard for a while and it helped me to remember, when the day wasn’t going quite the way I hoped, that we are each unique and that we are also very different from one another. We each have ways of dealing with situations and those ways are not always the same and sometimes clash. I liked looking over at the quote and finding a way that we could each be ourselves while still respecting the other person’s opinion. Finding ways to allow your boy’s uniqueness to shine through will be helpful to him. In today’s society “different” isn’t always perceived as good. Yet, different is good. Leaders are different, visionaries are different, people who make a difference are different. Each child has unique gifts. Let’s think about how you can provide him with what he needs to pursue the gifts that he has been given. Find phrases you can say to him to help him realize just how special it is to be himself. Talk with him about how he is unique. Discuss ways he is different from others in a positive way. If he is unusual in a specific way help him to deepen his commitment to it. Tell him not to hide his unique gifts. Talk about ways you and he can nurture and value his quirks as well as his wonderfulness. Give him the tools he needs to pursue his goals, even if they are a bit off the beaten path. Get information on learning styles and help him develop a sense of self. By doing some of these simple things he will feel good about how he is different. Just thinking about and talking about all of this might bring up interesting questions for him, and you and he may end up having some great conversations surrounding this topic. I hope you will share this with your boy and with your other children. It is a quote worth reading and a message worth considering from time to time. If you liked this post you may also enjoy Children Are and Give Your Boy the Gift of Time. If you would like to share the quote, feel free to use our sharing tools below. Thank you so much for sharing this on Motivation Monday! I had a heart to heart conversation with one of my sons this week. He’s not athletic. He’s very awkward compared to other boys in his class. He can be prickly. He’s a bit immature. As his mom, I see other sides of him that his classmates who are teasing him don’t see. He loves to cook. He’s a World War II history fiend. He loves to take care of his youngest brother. After our chat, he gave me a big hug. I need to remember to remind him about what makes him unique often, not just when he’s upset.